Are you ready to save in the laundry room? Recently, my son participated in his high school science fair. He believed that his homemade laundry detergent powder would work better and cost less than commercial brands. This post is a review of his results, recommendations, and a homemade laundry detergent powder recipe for you to print and make your own. The cleaning results will impress, but the monthly savings will shock you! 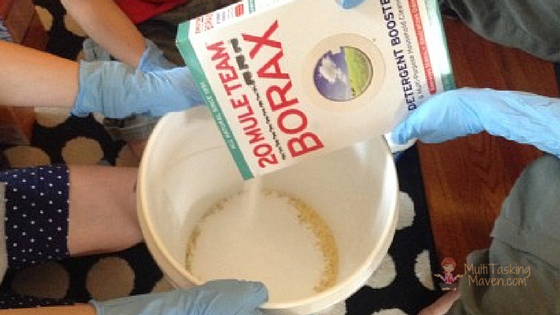 After researching homemade laundry detergent powderrecipes, he picked the one that added Oxi Clean for stain fighting. He chose hard to treat stains including grass, dirt, salsa, and chocolate. Finally, he recruited five volunteers to compare their experience with the homemade laundry powder detergent versus their commercial brands. Guess what? The homemade laundry powder detergent cleaned just as well as the commercial brand and was preferred by his volunteers for cleaning, smell, and cost! He included the laundry powder detergent recipe in each sample pack and two out of the five have made their own. The big win is the cost savings of making your own detergent. On average, volunteers spent $10 a month for detergent versus $1.66 a month for homemade detergent. The costs to make homemade powder laundry detergent is $20 and fills a 5 gallon bucket. Based on a family of six people and 15 loads of laundry a week, the average cost of homemade powder laundry detergent is a little over $3.00 a month versus $10-$20 for commercial laundry detergent. Purchase a grater that you will only use for this or other DIY projects. The residue left on the greater will cause a crazy mess if you put it in the dishwasher to wash. I recommend picking one up at the Dollar Store. The recipe he tested is low suds and can be used in high efficiency washers. My son added Lavender Purex Crystals. You can choose to use them or not, this is really a personal preference for smell. The detergent itself has a nice, clean smell without adding the Crystals. I am sure that with the popularity of oils that could be an alternative too, but I have not tried it. Finally, if you use a septic tank, you will not be able to use the powder formula, the detergent can form hard balls and clog your system. There are liquid alternatives. This is really a fun family project. My children and I helped my son shop for the ingredients and they helped him mix the ingredients. Don’t forget the savings, you can really clean up your budget too. (sorry had to add that one!) If you are looking for others ways to save, you might like the four tips I share in How to Save Money. Be sure to print the complete recipe HERE!